My family has a hard time finishing tray of lasagna. So these rolls are perfect. I love how they have all the lasagna taste, but not the entire tray of lasagna. They’re easy to freeze and reheat, also. This is a great weeknight or weekend meal. Make your sauce. Place the butter in a small sauce pot over medium heat. Allow the butter to melt and add the carrots and celery. Allow to cook for a few minutes. Add the canned tomatoes and a heavy pinch of salt. Allow this to simmer for about 40 minutes while you prepare the roll mixture. In a saute pan over medium heat, heat about 1 tbsp of olive oil. Once hot, lower to medium low and add the onions and let them sweat for about 5 minutes. Add the garlic and cook till fragrant. Next, add the turkey sausage, season with a pinch of salt, a grind or two of black pepper, and a pinch of red pepper flakes and allow to brown. Remove from heat and allow to cool slightly. Bring a pot of water to a boil and boil the lasagna noodles per package instructions. Drain and run under cold water when complete. Back to the sauce. Remove from heat and with either an immersion blender or a powerful blender like a vitamix, blend the sauce together. Check for seasoning. Add the 2 tbsp of heavy cream and set aside. Spray a 13x7 baking dish with non stick spray. Meanwhile, in a medium bowl, mix together the mozzarella, parmesan, cream cheese, egg, salt, pepper, pesto and garlic powder. Combine the cheese mixture with the turkey sausage and give it a good ole’ stir. Line up your lasanga noodles on a workspace. 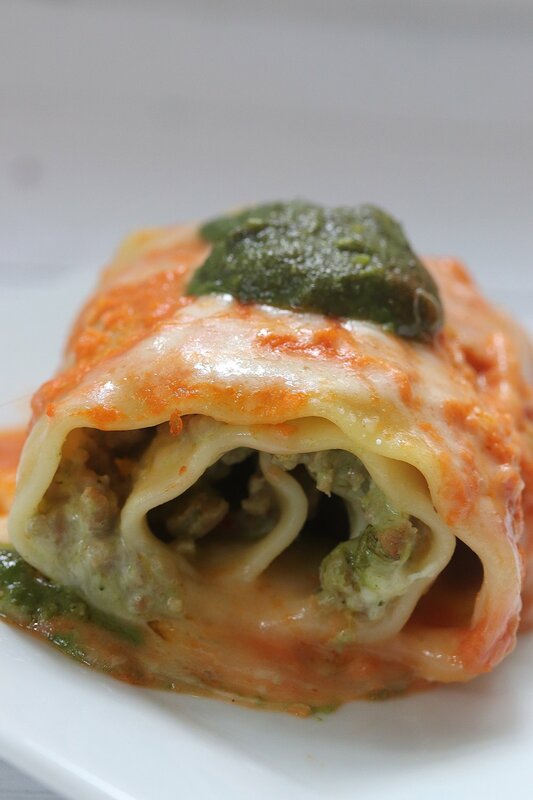 Place about a tbsp or two of turkey cheese mixture in each noodle and roll them into lasagna rolls. Place them seam side down in your 13x7 baking dish. Repeat until all the noodles or the mixture is gone. Next, pour as little- or as much- sauce on each lasanga roll. Place a dollop of basil on top. Bake in a 350 degree oven for 30 minutes and serve with a fresh salad, like this arugula parmesan insalata.